Is your child’s shyness getting in the way of meeting new friends? Many children want to make friends but often don’t know how. This audiobook story could help. 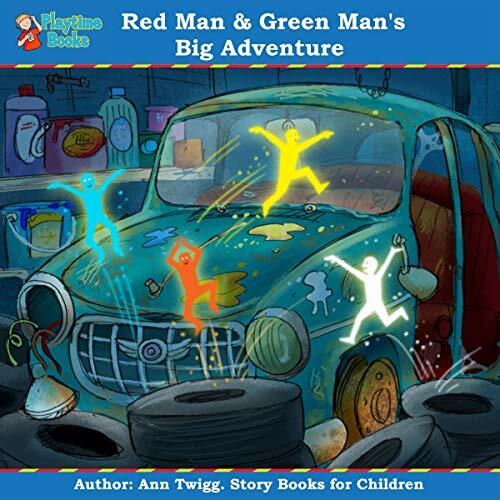 This is the second audiobook in a series of Red Man and Green Man audiobooks for kids authored by Ann Twigg and is written with a view to trying to help children overcome their fears of shyness. When Red Man and Green Man find themselves in a little park a short distance away from the traffic lights, they begin to feel a little frightened because it’s in total darkness, just like small children might when it begins to go dark. They feel even more scared when they wake up the two squirrels, Berty and Benny, who had gone to sleep for the night up in a big tree. But the squirrels are very friendly and are so pleased to have some new friends to play with in the park. Sometimes, small children can feel a little nervous when they meet other children for the first time, and it might take them a while to shake off shyness. Berty and Benny can see they are frightening the traffic signal men, but they tell them that all they want is to have some fun in the dark and tell them not to be scared. Small children can often overcome their shyness quickly when they start playing, and this is what is explained in this audiobook. Audiobooks are a great way for children to use their imagination, and through play they can overcome their fears. Ann’s way of telling the story will have your children hooked within seconds of starting to listen. Scroll up to add this audiobook to your cart.